A Beach Holiday in Ghana? On your next beach holiday, why not try something different? Try Ghana. It may not be the first country that springs to mind, but Ghana has everything for true beach lovers. Here we give you an introduction to some of the best beaches in Ghana. Scroll further down, and you will find general travel information about Ghana. Ghana is situated just above equator on the Northern Hemisphere with a 560 km (350 miles) coastline facing south in the Atlantic Ocean. Here we focus on seven of Ghana’s beaches. Easily accessible beach from Accra. It takes only 45 minutes to get there from the capital city of Ghana. The beach is arguably the best and cleanest in the vicinity of Accra. Kokrobite has a good reggae vibe with a mix of Ghanaians, expats, and tourists visiting the beach. The action is centered around Big Milly’s Backyard offering good value accommodation, a big outdoor bar, a restaurant, a great chill-out wooden deck overviewing the beach, and the legendary Mr. Bright’s Surf School. Cape Coast is a hub for NGO’s and volunteer projects in Ghana, so you will find several groups of young adventurers from Europe and North America. Cape Coast is also a popular stop for tourists wanting to see the Cape Coast Castle which played a central role in the horrific Gold Coast slave trade. You will find some good restaurant in town – try the vegetarian Baobab House and Oasis Beach Resort’s Restaurant – and a few good nightlife spots. The beach is narrow and there are often strong currents, so exercise caution if you go swimming. Butre Beach in the Western Region offers a long stretch of pristine beach. The village of Butre is right at the beach, and a squeaky wooden bridge over a river leads you to the charming Hideout Lodge and the artsy Fanta’s Folly Beach Lodge further along the beach. Both are great places to unwind and escape from the hectic city and village life in Ghana. This is the wave surfing capital of Ghana. Great surf spots for both beginners and advanced surfers, and with two great locally run surf schools – Ahanta Waves Surf School & Camp and Black Star Surf Shop, there is no excuse not to try navigating the waves. Busua has several accommodation options, restaurants, and bars, and is perhaps the most popular holiday destination in Ghana. Busua has a nice mix of local fisherman’s life and beach holiday vibe. Akwidaa is a seaside town 45 bumpy minutes from Agona. There are nice beaches on either side of the village. Just west of Akwidaa, you can stay at Ezile Bay Ecolodge. The location is beautiful with ample space, palm trees, and soft sand. East of Akwidaa you will find Akwidaa Inn, another lodge right on the beach. There are good surfing spots in the area with empty line-ups, and Akwidaa gets you right into the daily life in a Ghanaian beach village. Cape Three Points is located at the southern tip of Ghana, and is in fact the nearest landpoint to the geographical centre of the world at zero latitude and zero longitude. The Cape Tree Points lighthouse marks this point. East of the lighthouse, you will find a long stretch of beach and a few small coves. The beach is wide and stunning in its beauty, and the waves are rough to the delight of intermediate and experienced surfers. Cape Three Points is also where you find Ghana’s top ecolodge, the inspiring Escape3Points Ecolodge. Axim is home to the second oldest fort, Fort San Antonio (1515), in sub-Saharan Africa, and it used to be one of the most important trading posts in the 16th century. It is also the largest city west of Takoradi. The city has a rocky beach where it is generally unsafe to swim, but there are superb beaches and accommodations a little out of town. Check out Ankobra Beach Resort, Axim Beach Resort, and Lou Moon Lodge. 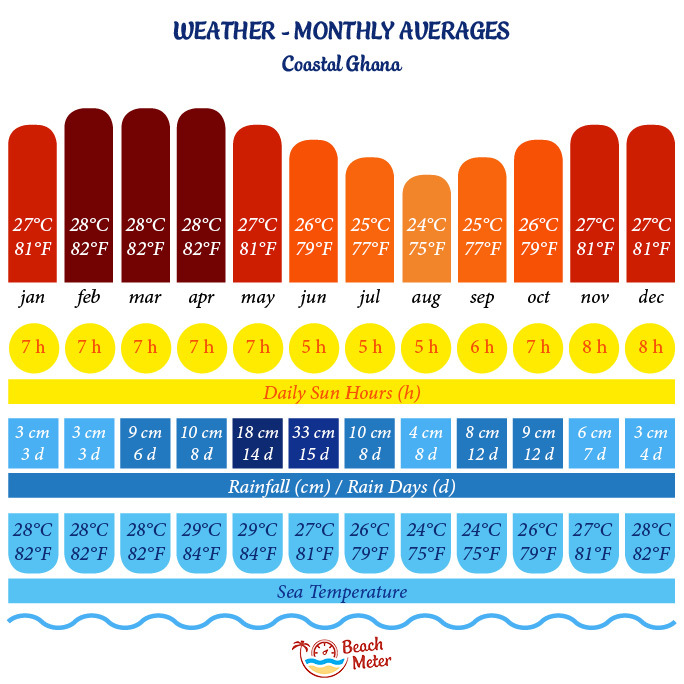 The coast of Ghana has two rainy seasons and dry seasons in between. The first rainy season usually starts in May and last until July. It will rain regularly during July and August and then the second and smaller rainy season arrives in September. The rainfall is irregular, but when rain falls, it falls! Temperatures during these months will drop, and it can actually be necessary to wear a jumper at night. November to April is usually quite dry and warm. You can travel to Ghana all year round, but be aware that some of the roads off the main highways become very hard to navigate when the rain has fallen. You will often need a 4×4 vehicle to get to Butre, Akwidaa, and Cape Three Points. If you are intrigued about visiting the beaches of Ghana, you are probably wondering about the what’s, why’s, and how’s of traveling to Ghana. We have put together a small guide for you to get you started. People of most nationalities need a Ghanian visa to enter the country. It is currently not possible to get a tourist visa on arrival in Ghana, so you must apply for a visa at the nearest Ghanian representation in your home country. Often you will need an invitation letter to get a tourist visa. If you don’t know anyone in Ghana, ask your hotel, hostel, or lodge to email you an invitation letter. From our personal experiences, we suggest you allow plenty of time for the visa process – at least two weeks. Also, remember to consult your doctor regarding vaccinations. You MUST have a yellow fever vaccination and proof thereof to show at the immigration. Getting to Ghana is quite easy. Accra, the capital of Ghana, is a transportation hub in West Africa. This means that many of the big airlines have direct flights from their main hub, and because of the competition, the air fares are very competitive compared to other travel destinations. Once visa and vaccinations are covered, the fun starts. Ghanians are generally very helpful and most people speak English. The infrastructure is made for local travellers and not foreign tourists, which can be good or bad, depending on how you view it. There are no scheduled buses and no taxi-meters. The most common means of transportation is by “tro-tro”, which is like a van. You would think a tro-tro fits maximum 11 people, but you may end up riding with 16 other passengers. The other option is taking a ford van or a VIP bus between bigger cities. These are more comfortable and cost slightly more. For all transportation options, they only leave once full. You may wait 5 minutes or 5 hours, depending on you timing and your destination. That’s why we highly suggest that you allow plenty of time for travelling on the road. If you want luxury, your options outside of Accra are very limited and not of particular good value. However, options in the low- and mid-range are abundant. Since Ghana is a very popular spot for young volunteers, there is no shortage of cheap dorm beds along the coast. Prices range from 15 to 40 Ghana cedis a night, which is about 4 to 10 US dollars. Private rooms for two people usually range from 50 to 200 cedis (12 to 50 USD) per night. The food prices range from extraordinarily cheap local food at around one US dollar per meal to 15 for a meal at a resort restaurant. If you want fresh seafood straight from the boat to the barbecue, Ghana’s towns along the coast will deliver on most days. Politically, Ghana is currently one of the most stable countries in West Africa. Petty theft and corruption are issues, but as long as you keep your head straight, this should not be a major annoyance. A few things, you should be aware of though is tropical diseases, quality of health clinics, and traffic. Monitor your health carefully and be sure to bring along a first aid kit. As strange as it may sound, some hospitals and health clinics do not have malaria testing kits and it’s not uncommon that they are short on standard medicine too. Should you end up at one of Ghana’s hospitals, be sure to have someone with you. You have to bring your own pillow and blanket to the hospital. Food and water is not served, and you are not given ropes for changing in all but a few international clinics. It should be mandatory that you have a health insurance, so you can go to the best hospital in the area without worrying about the bill. Also remember to only drink bottled water. In Ghana you will see everyone drinking water from small sachet bags. This water varies in quality and taste, so be cautious. The roads in Ghana have improved over the last 5 years, but frankly, that’s not saying a lot. As soon as you move away from the main roads, you meet dirt roads with huge potholes. That coupled with vehicles in questionable shape, bad lighting of roads and from cars, and occasional flooded roads make traffic the number one safety concern. In general, you should avoid traveling during night. While you will see a lot of smiles, you will also come by aggressive arguments over petty issues. A lot of the gesturing and yelling during arguments is about show, and you will very rarely see any physical contact. Lastly, all along the coastline of Ghana, the sea can be very dangerous. Every year several people loose their lives to the sea. Waves and currents can be very powerful, and even good swimmers get in trouble, if they panic. Our recommendations are to never swim alone, be aware at all times of currents taking you out to sea, and study how to get out of rip currents before enjoying the big waves. Very generally speaking, there are four types of travelers in Ghana. 1) Young volunteers staying in Ghana for anything from three weeks to one year. 2) Expatriate families working for embassies, NGO’s or private international companies. 3) Backpackers traveling through the region the rough way. 4) Surfers who come to enjoy the pleasantly warm water, great waves, and comparatively empty line-ups. For some reason, there are an extraordinary amount of Germans in Ghana. Otherwise British, Dutch, other Europeans, and North Americans dominate the tourist market. But chances are that the obruni (foreigner) sitting across you in the restaurant is German. Ghana has some fine national parks incl. Kakum near Cape Coast, Mole in the Northern Region, and Kyabobo National Park and Agumatsa Wildlife Sanctuary in the Volta Region. Wildlife in Ghana is not on par with that of Eastern Africa, since Ghanaians have a long tradition of killing and eating pretty much anything that moves, and habitats have decreased drastically. For a quick overview of Ghana’s most important national parks, take a look at TimeOut’s Wild Ghana. Ghana’s coast is still dotted with old forts and ruins from the slave trade. Don’t spare yourself a guided tour through one of the forts. You will exit humbled and sad, but life in Ghana will bring you right back to smiling. And that brings us to perhaps the biggest attraction, the Ghanians. You will see a lot of smiles, get a lot of greetings, and witness a lot of spontaneous dancing on the streets. You will be helped if you ask, and you will have no problem finding new friends. We have to mention funerals, as they a huge part of Ghanian social life. Should you be invited to a funeral, you should definitely go. Contrary to what you may think, funerals are actually parties, celebrating the life of the deceased and the joys of life. In Ghana, funerals are a substitute for going out on Friday and Saturday nights. Here are a few other links where you can get answers to your questions about living and traveling in Ghana. Enjoy! Ghana Westcoast | guide to the coast of Ghana from Cape Coast and westward. Accra Expat | a comprehensive guide and forum to just about everything related to Ghana.